Mexico's President Andrés Manuel López Obrador said he would not be drawn into confrontation on the issue. Foreign Minister Marcelo Ebrard said in a tweet that Mexico was a "great neighbour" to the US and would "not act on the basis of threats". Mr Trump told reporters on Friday: "There's a very good likelihood that I'll be closing the border next week, and that will be just fine with me." The president later wrote a series of tweets which concluded that because the US "lose so much money with them, especially when you add in drug trafficking etc., that the Border closing would be a good thing!" The US president has also instructed the state department to cut off all direct assistance to El Salvador, Honduras and Guatemala - where many of the migrants come from. The move has to involve Congress, many of whose members have authorised the monies to tackle the root causes of the migration. President López Obrador said on Thursday that the issue of migration was "not up to us Mexicans". He said it was a problem stemming from Central American countries rather than Mexico. "The Mexican is no longer seeking work in the United States. The majority [of migrants] are inhabitants of our fellow Central American countries," he said. Following President Trump's tweets on Friday, Mr López Obrador told a crowd of supporters: "I want to make it clear that we are not going to fight with the United States government. Peace and love." He referred to migration as a "human right" and said: "People in Central America don't have any options, so they set out looking for a way to earn a living." Why does Mr Trump want to close the border? 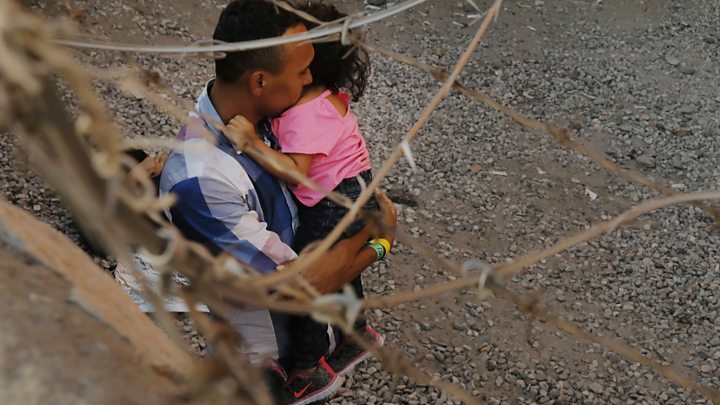 Homeland Security Secretary Kirstjen Nielsen said border patrol staff had been overwhelmed by a huge increase in asylum seekers fleeing violence in El Salvador, Honduras and Guatemala. Department of Homeland Security (DHS) officials said that border apprehensions in March were expected to total 100,000, the highest in a decade. More than 1,000 unaccompanied children are among those currently in custody. Ms Nielsen warned Congress that the US government faced a "system-wide meltdown" as it tried to care for the 6,600 immigrant families currently in custody. It is unclear how closing entry ports might reduce the number of migrants entering the country, as many arrive at unofficial points of entry and can legally request help the moment they step on US soil. The DHS has moved 750 border staff from entry ports to help process asylum seekers arriving between official crossing points. Ms Nielsen warned Americans that they "may feel effects from this emergency". Lack of staffing is already having an impact. Traffic jams at the crossing between Cuidad Juárez and El Paso, Texas, were longer than usual on Friday, with one driver claiming she had been stuck for three hours, Reuters news agency reported. A border closure could have a significant financial impact, disrupting tourism and trade between the US and Mexico, which reached a total of $612bn (£469bn) last year, according to the US census bureau. Kurt Honold, head of business group CCE in Tijuana, Mexico, said there could be billions of dollars of losses. "It's obvious he's not measuring what he says," Mr Honold added. Mr Trump's 2016 presidential bid was based on a crackdown on illegal immigration, with him blaming Mexico for "bringing drugs, bringing crime, their rapists". His famous promise to "build a wall" so far remains unfulfilled as Congress refuses to fund it. However, the president has declared a national emergency in order to direct funds away from the military and towards the wall. Since his election in 2016, Mr Trump has made repeated threats to close the US border with Mexico. On Thursday, Mr Trump told a crowd of supporters at a rally in Michigan that the US would "close the damn border". On Friday, Mr López Obrador told reporters: "All this talk of migrant caravans and such is related to politics and the [US] election campaign- that's why I'm not going to get into it."